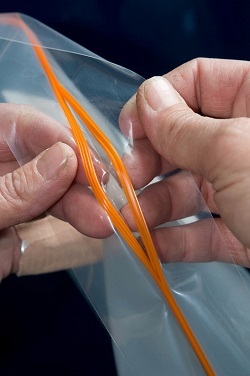 Ziptop bags—primarily made from polyethylene plastic—are versatile and easily customizable, and can be identified by the type of seals they have at the top. These types of seals allow for the bag to both protect its contents from outside elements and prevents spilling or leakage from the inside. Because of their reliability, versatility, and affordability, custom ziptop bags are utilized by businesses across countless industries. The closure mechanism of a ziptop plastic bag can commonly be found in two forms. The first is a set of tracks in which one locks into the other, creating a seal so tight that it requires quite a tug to be pulled back apart. The second is the zipper closure seal, which consists of two thick plastic lips at the top of the bag, plus a small plastic zipper that slides along the two lips and pushes them together. Other types of seals can be utilized for products, such as wire twist ties, heat seals, and shrink wrapping. However, heat sealed and shrink wrapped bags, though effective, cannot be reopened. Twist ties are easy to use, but do not create an impervious seal. For optimal protection and user-friendliness, ziptop plastic bags are recommended. Since ziptop plastic bags can be customized in a variety of ways, it is imperative that you know every single requirement of your application, and do extensive research on the manufacturer that provides ziptop bag customization services. Would the zipper seal be more beneficial than the two-track seal? Do the desired contents need to be protected against UV radiation or static electricity? Are the contents fragile? Do they need to have a distinguishable label? Fortunately, there are manufacturers of custom ziptop plastic bags that can do all of the above. They may provide ESD pink bags that absorb static, amber-colored bags that absorb UV radiation, or impact-absorbing bubble cushioning. Additional features include divided compartments, transparent or translucent plastic, graphic hot stamping, and many more. For years, industries ranging from food to medical have utilized custom ziptop plastic bags to not only protect their product, but to display their brand logo. Hospitals and labs request custom ziptop bags with biohazard or drug labels to easily make their contents identifiable, ensuring the safety of workers and patients alike. Food manufacturers use custom ziptop plastic bags with their brand label so their products stand out from their competitors. No matter what your application, a reliable manufacturer of custom ziptop plastic bags will have the capabilities in making the bag that suits your needs. Some may specialize in certain industries, which is why research is highly recommended in selecting a manufacturer. A multitude of reputable custom ziptop bag manufacturers can be found here on IQS Directory, and will be ready to assist you. Custom Ziptop Plastic Bags Ziptop bags—primarily made from polyethylene plastic—are versatile and easily customizable, and can be identified by the type of seals they have at the top. These types of seals allow for the bag to both protect its contents from outside elements and prevents spilling or leakage from the inside. Because of their reliability, versatility, and affordability, custom ziptop bags are utilized by businesses across countless industries.